More than 140,000 cubic yards (roughly 40,000 tons) have been removed since the clean-up effort began. The Harris County Flood Control District (HCFCD) said Friday it has completed a county-wide effort to remove downed trees and other storm debris that blocked the bayou drainage system since Hurricane Harvey hit Texas more than a year ago. More than 140,000 cubic yards (roughly 40,000 tons) have been removed since the clean-up effort began shortly after the storm at an estimated cost of $8.9 million so far. 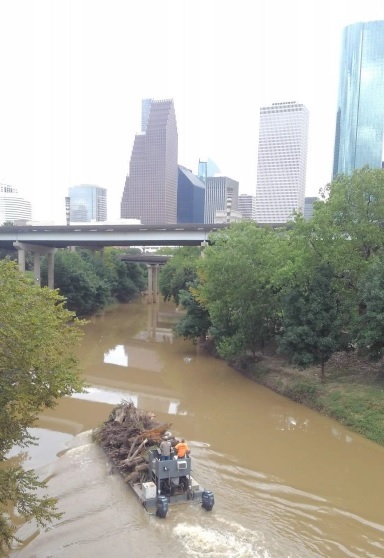 In recent months, crews have removed more than 25,000 cubic yards (7,042 tons or 642 truckloads) of debris from Buffalo Bayou, and 14,000 cubic yards (3,978 tons or 327 truckloads) from Cypress Creek. Removing debris from within the county’s 22 watersheds was a priority because downed trees and other storm debris can impede storm water flow and increase erosion, especially along natural forested channels. Debris has included refrigerators and other large objects washed into the channel, as well as six automobiles. The Flood Control District is working to secure funding for its disaster-related storm debris removal efforts from FEMA. Approximately $2.5 million have been received so far in disaster aid for channel debris removal. Residents are encouraged to report bayou and creek debris to the Flood Control District’s Citizen Service Center at this website or by calling (713) 684-4197.